J. C. HOGUE (Nickname "Jake," no name only initials) the son of John William Hogue and Ina Jewel Edwards Hogue was born on 17 March 1919 in Dalhart, Dallam County, Texas. 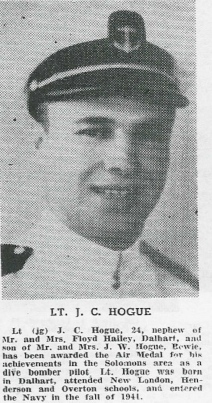 He died on 29 January 1966 at the United States Air Force Hospital in Rota, Spain, from complications following surgery. He was buried on 2 February 1966 in Arlington National Cemetery, Section 37 Site 1401. 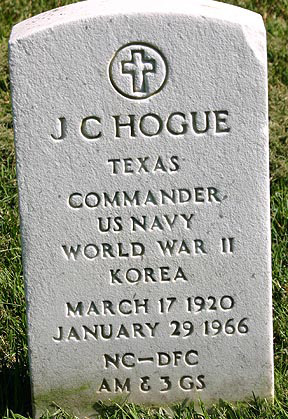 J. C. Hogue served in the United States Navy from 21 November 1941 until 29 January 1966, rising to the rank of Commander. 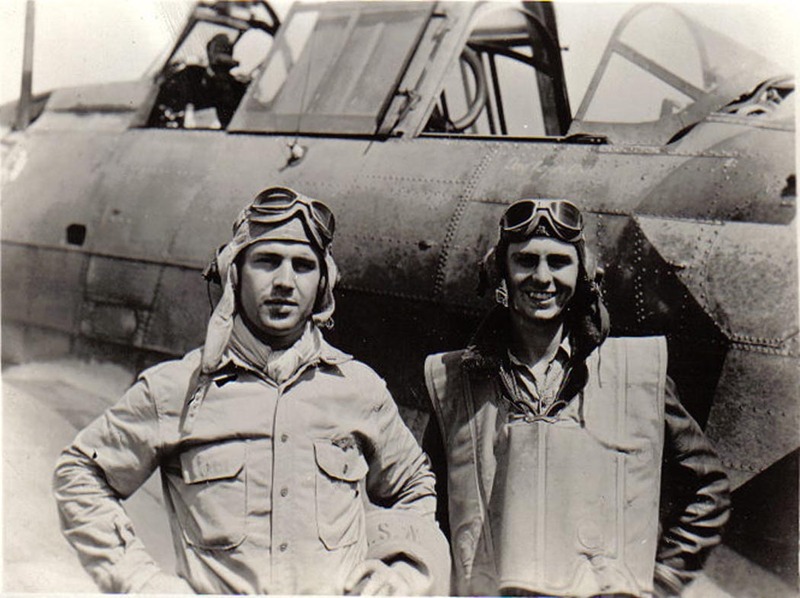 He was a Nval Aviator and during World War II was a Hellcat fighter pilot, taking part in the Battle of Leyte Gulf with Fighting Squadron 15 during a tour of duty aboard the USS Essex. Following the war, he took part in the Berlin Airlift. During his military career he was awarded the Navy Cross, the Distinguished Flying Cross, the Air Medal, the American Defense Service Medal, the Asiatic-Pacific Campaign Medal, the World War II Victory Medal, the Navy Occupation Service Medal, the National Defense Service Medal. The President of the United States takes pleasure in presenting the Navy Cross to J. C. Hogue, Lieutenant, Junior Grade, U.S. Navy, for extraordinary heroism in operations against the enemy while serving as Pilot of a carrier-based Navy Fighter Plane in Fighting Squadron FIFTEEN (VF-15), embarked from the U.S.S. ESSEX (CV-9), in action against enemy Japanese surface forces over the Sibuyan Sea during the Battle for Leyte Gulf in the Philippine Islands on 25 October 1944. His outstanding courage and determined skill were at all times inspiring and in keeping with the highest traditions of the United States Naval Service.